On face value, this appears to be your every day friendly celebration of the new Women’s World Road Race Champion receiving her rainbow jersey; but look carefully and there’s another peculiar story unfolding. 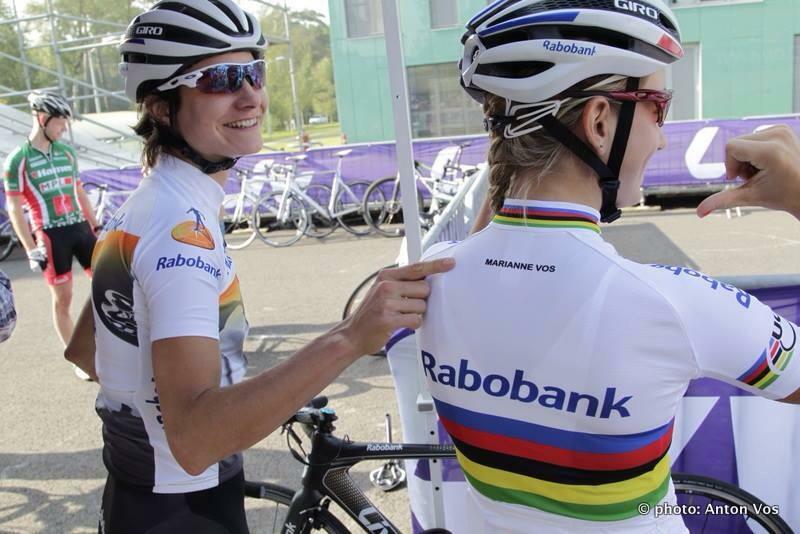 It looks like Pauline Ferrand-Prevot was handed a new jersey, but Rabobank got into ‘auto’ mode and printed ‘Marianne Vos’ name on it. After all, Marianne, aka Vos-the-Boss, has won it 3 times before; you’d be forgiven for thinking she’d won it again. It may need some wearing in before the rainbow jersey gives up the Boss’ name, but great to see that both teammates can see the funny side of it all. Bravo!